Left: Huawei P20 Pro smartphone. Right: Ren Zhengfei, founder and CEO of Huawei. Chinese tech giant Huawei is embroiled in numerous controversies including allegations of corporate espionage, fraud, attempted theft of a T-Mobile robot, and violation of sanctions against Iran. It’s also the manufacturer of great consumer products like a nearly flawless MacBook Air clone and one of the most technologically advanced smartphones on the market. It’s becoming increasingly difficult to talk about one without the other. So let’s talk about it. First, there’s the terrible pall around the company. Earlier this week, the U.S. Department of Justice announced indictments against Huawei. In Seattle, a grand jury returned an indictment for 10 federal crimes related to Huawei employees attempting to steal secrets from phone carrier T-Mobile. This includes the company instructing employees to violate non-disclosure agreements, obstruction of justice charges, and even attempting to steal physical components from a robot T-Mobile uses to test phone durability. Meanwhile, in New York, a grand jury returned an indictment for 13 separate crimes, alleging that Huawei and Iranian affiliate Skycom committed fraud and money laundering in an attempt to circumvent American sanctions against Iran. Huawei CFO Meng Wanzhou, the daughter of CEO Ren Zhengfei, is at the center of many of these accusations, with the DOJ alleging that she made false statements about Huawei’s interactions with Iranian businesses. Meng was arrested by the Canadian government in late 2018, and her arrest has led to considerable tension between China, Canada, and the U.S.
It’s a firestorm of bad publicity for the company, but it’s not the first time Huawei has suffered under the gaze of the international community. Huawei was founded in 1987 by Ren Zhengfei, a former officer (specifically deputy director of engineering) in the People’s Liberation Army. His military connections have significantly contributed to the rumors and accusations of the company’s alleged misdealings. “Not only is Huawei financially and politically supported by the Chinese government but also its origins as a military-backed company continue to pay dividends, including a contract to maintain the Chinese military’s telecoms backbone,” claimed a piece in an issue of Far Eastern Economic Review published back in December 2000. The standing theory is that Ren is well respected still by military leaders, who toss the company good contracts and lean on the non-military side of the government to give Huawei contracts as well. “It also receives state support in the form of tax privileges and state-sponsored credit because it has been designated a ‘national champion’ of new technology,” noted an unclassified Canadian Security Intelligence Service report in 2003. This has supposedly given Huawei leeway to make some deals that might otherwise be ill-advised. In 2001 (and 2000) Huawei violated UN sanctions and developed networks for Iraq, including missile defense systems. At the same time, India accused Huawei of creating a custom communication network for the Taliban in Afghanistan. Huawei denied it. As it currently denies any wrongdoing related to the myriad of charges levied by the U.S.
“I love my country, I support the Communist Party. But I will not do anything to harm the world,” CEO Ren said in a roundtable earlier this month. But it might not be up to him. “Because of the nature of the political system in China, you are naturally associated with the government and the government could put a lot of pressure on any firm in China to turn in data and to spy on other countries,” Lynette Ong said. Ong is an Associate Professor of Political Science at the University of Toronto and specializes in Chinese politics and political economy. So far, Huawei has struggled to prove that independence, and it’s severely hampered its business, particularly in the U.S. While we’ve been hearing about great Huawei phones for five years now, they haven’t been sold by any U.S. phone carriers. Why? Because of a 2012 Congressional report that effectively banned it from selling telecommunications gear in the U.S., and, according to The Wall Street Journal, discouraged phone carriers from creating formal partnerships. And now? It’s certainly interesting that the United States renewed its interest in restricting Huawei’s business almost immediately after the company surpassed an American company, Apple, as the second largest seller of phones in the world. Moreover, it comes at a time when the deployment of equipment for new 5G networks is ramping up. Huawei is positioned to supply much of the gear necessary to develop 5G networks for telecoms overseas—its gear is already banned in the U.S.—including for the networks of Deutsche Telekom (which owns T-Mobile) and Softbank (which owns Sprint). “The U.S. definitely sees up and coming competition, and it is rolling out all the strategies possible to impeach the growth of its competitors,” Ong said. Carolina Milanesi, a consumer technology analyst with Creative Strategies seconded this notion. “There is no question in my mind that the extra scrutiny Huawei has been under as of late has to do with the political environment between China and the U.S. as well as the high-stakes around AI and 5G,” she wrote in an email to Gizmodo. In an effort to secure their merger, T-Mobile and Sprint pledged to not use Huawei’s tech. 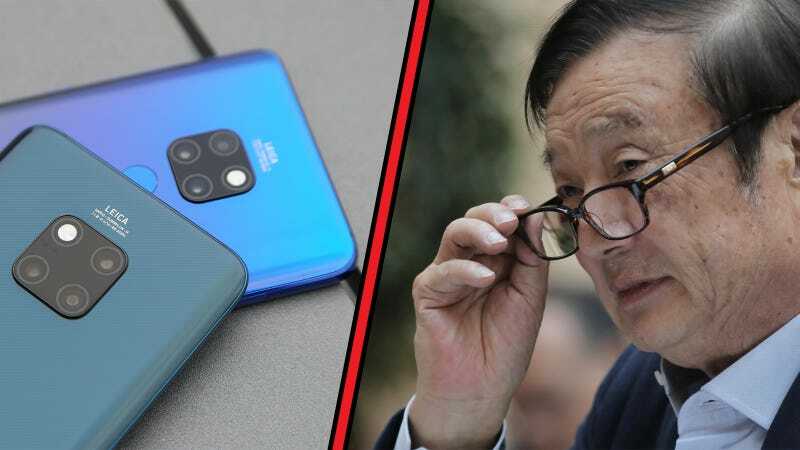 And as Engadget notes, the recent flurry of espionage rumors has led countries, including the U.S., New Zealand, and Australia, to ban Huawei equipment from being used to build networks. Telecoms in the UK, France, and Japan have also expressed reluctance to using Huawei equipment, citing security concerns. This is a significant part of Huawei’s business, and its legal problems in the United States, as well as the accusations of espionage, stand to cost it billions in lost business. “I think it is a real threat—something that may actually cripple the company, at least in the western market,” Ong said. “It makes it really hard for Huawei and other openly Chinese brands to succeed in the U.S. consumer market,” Milanesi said. While the company has been stymied by the American government for some time, it’s found methods of circumventing it by targeting consumers and tech journalists, wowing us with well-designed products that are often much cheaper than what we could get from a company with less of a stink around it. It’s tempting to separate the bad behavior from the objectively good products. We do this all the time with American companies. Amazon’s CEO is the richest man in the world—so rich, his wealth seems immoral. His company regularly practices union busting, struggles with privacy issues, and touches nearly every point of our online lives in a way that feels terrifyingly invasive. It also makes a lot of pretty good and extremely cheap stuff. And who doesn’t love all the benefits of Amazon Prime? Amazon’s goods and services are so good we’ve asked if we’re evil for buying from the company. Google doesn’t feel much better sometimes. There was that time Google tried to help the Pentagon build drones (the venture was killed after employee protests). And that time it nearly helped the Pentagon with a massive cloud computing project (it dropped out of that one too). Google’s also, you know, watching our every move thanks to a mix of Google search, Maps, Android, and other services. Yet, we still love chromebooks and the Pixel 3. There is a disconnect between these companies, their often heinous actions, and the products they produce. I want to tell people to buy the Huawei MateBook Pro X because it’s a marvelous machine, complete with a camera that’s tucked away behind a button so it can’t watch you without permission. But then I think about what would happen if Huawei is driven out of the U.S. How would you get your laptop serviced? Is it worth the risk of losing support down the line? Huawei’s Mate 20 Pro is an incredible smartphone. But do you want to buy a phone from a company that’s accused of espionage? I’m still not sure. The tech might be exceptional, but the baggage seems awfully heavy.